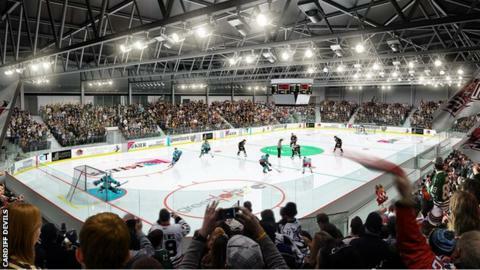 Cardiff Devils have named the 12 March visit of Belfast Giants as the first game at their new home. They had intended to host Coventry Blaze on 27 February at Ice Arena Wales, but were forced to delay the new venue's opening encounter. Blaze will now be the last visitors to Devils' current venue the Big Blue Tent on Saturday in the Elite League. Devils were initially set to move into the new arena in August 2015 and the delays have cost them around £300,000. The new venue can hold 3,088 while their current home holds 2,300 people. The Devils had already apologised to opposing teams' fans who may have planned to see their teams at the old or new venues. The current venue has been Devils home since 2006 when the Wales National Ice Rink in Cardiff City centre was demolished. In a statement Devils said: "The "temporary" facility that was meant to be up for three years and ended up being the Devils home for the last decade."